A. S. Paterson Company Limited is a national chemical distributor dedicated to understanding the requirements of our customers and consistently supplying the products and services to meet their needs. To successfully serve our customers, we will be sensitive to the needs of our environment, our employees and our suppliers. Synthesis with Catalysts Pvt. Ltd is one of the upcoming companies in the production and development of Precious metal catalysts, Ligands, Chiral Complexes and various other catalysts. We have a team of product specialists for developing Catalysts, Complexes and Ligands from precious metals like Palladium, Ruthenium, Rhodium, Iridium and Platinum etc. A shotgun library is a collection of random-sheared DNA molecules. These libraries typically consist of inserts ranging from 1-10kb and extensively used in DNA sequencing, gene screening and DNA mapping throughout the world. Natural food colours is a dye, pigment or any other substance obtained from vegetables or minerals that are capable of coloring foods or drugs. Sources like seeds, fruits, grass and turmeric & many more. Alfa Chemistry offers analytical characterization services to our clients worldwide. Our broad portfolio of analytical methods includes HPLC(-MS), CE, GC(-MS), FT-IR, NMR, XRD, DSC, ICP, particle size determination, and many more. Additionally, we perform microbiological tests s and quantify bioburden and endotoxin. GoGoNano™ has a range of products made with the cutting edge nanotechnology. Our all-in-one solutions from stain removers to super hydrophobics combine all types of nanopolymers to reach the maximum benefits of the products. 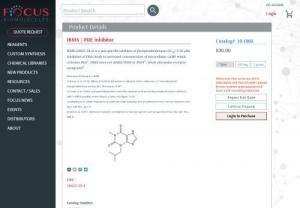 IBMX is a pan-specific inhibitor of phosphodiesterases supplied by Focus Biomolecules, a customer oriented small molecule based life sciences company. We are offering the high quality of Apelin Peptides Products. Apelin is a 36-aa peptide derived from a 77-aa precursor, preproapelin, for which cDNAs have been cloned from humans and animals. Bio-Synthesis\' streamlined protein expression services can take your project directly from gene synthesis to protein expression, refolding, purification, and stable cell line generation. Bio-Synthesis offers high quality Endothelins and Related Peptides Products for such Big Endothelin 1 (1 - 39), porcine, Endothelin 1, human, Endothelin 1, human, FAM - labeled, etc. Our custom siRNA synthesis services are delivered in desalted, purified, annealed duplex format with modified nucleotides of DNA, 2\'OMe, and Constrained Nucleotide bases. Bio-Synthesis offers DNA-peptide conjugates by using selective cross-linking chemistries in high quality and yields.